© Stefan Jora, Duboce Park, 2005. All rights reserved. During that mid-decade time of 2005, when I was very fresh to photography-making following an academic meltdown, I moved to San Francisco seeking to create a new life for myself. At that time, well into the digital revolution, I was using film and an old Minolta manual focus camera with a standard (50mm) lens, while sometimes experimenting with infrared film and a red filter. 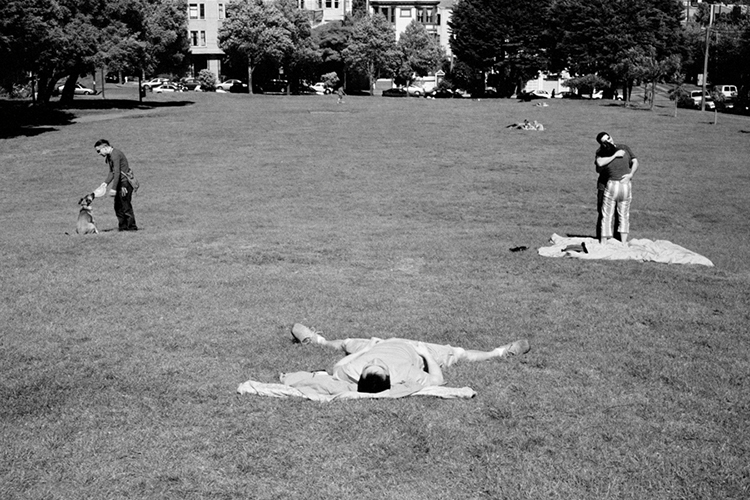 Still under Henri Cartier-Bresson's spell, whom I had discovered during a serious bout of depression, I passed through Duboce Park with my girlfriend on one sunny Sunday afternoon and stumbled upon this scene. Being in my early twenties, I still had the naïveté required for one to follow his heart aimlessly, without requiring much thinking. Looking at this image again seven years (and about five months) later, I like it for its understated simplicity that seems to reference the park's location in the Duboce Triangle. I also feel I can relate to the young man laying in the grass, dreaming of others and their relationships, in the same way I currently dream of identifying the essence of such relationships with the camera. Jora’s indiegogo fundraiser to help finish a photobook project on gay families can be found here.